For "on the job" waterless toilets browse the bottom of this page for our low cost solutions that can be installed and ready to use in a couple hours. These systems come with a comprehensive DIY installation manual and can be used in an existing shed or outhouse. Don't have anything in mind to house the toilet? No problem! 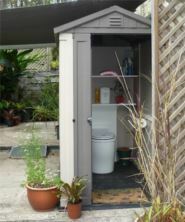 An Outloo shed with a 10 year warranty can be purchased at the same time as the toilet. To purchase a larger system or receive a freight quote, please phone us toll free on 1300 138 182 or email info@ecoflo.com.au. Answer questions to find out the best composting toilet for your needs. Ecoflo was the first company in Australia that sells composting toilets certified to the rigorous quality testing of Australian Standards. If you want to be certain your composting toilet has adequate capacity, and is safe, you need a waterless composting toilet certified to the tough performance criteria of AS 1546.2.